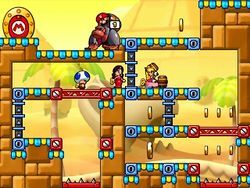 Dashing Desert is the fifth world of Mario vs. Donkey Kong: Tipping Stars. 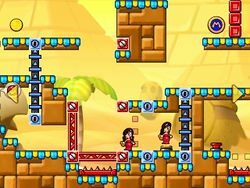 During this world, the player is acquainted with a new gameplay mechanic, the Blue Lift, which is used to elevate the Minis to platforms located directly above or bring them to a lower level. Lift Pickups are also introduced along with them. 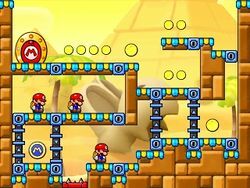 Mechanics introduced in previous worlds, such as Girders, Springs, Cannons and (Purple) Conveyors, make a return in Dashing Desert. 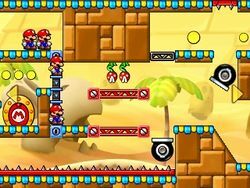 Three new toy types—Pokeys, Piranha Plants and a Capture Kong—are encountered here for the first time in the game, while Fire Piranha Plants reappear from the previous world. Mini Paulines also begin to appear in this world. 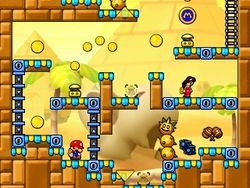 The background features several Egyptian pyramids, along with two gigantic skulls of Dry Bones resting in the dunes, surrounded by a few stone Shy Guy statues and palm trees. 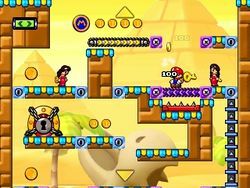 The soundtrack that plays in this area is a variation of the soundtrack of Sandstorm Steps from Mario vs. Donkey Kong: Mini-Land Mayhem! 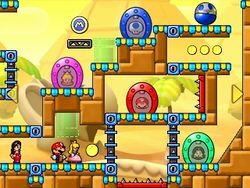 There are two Bonus Levels that are set in this world, B-9 and B-10. 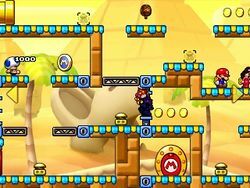 This page was last edited on April 11, 2019, at 19:32.